The National Park Serra dos Orgãos (Organ Mountain Range) was founded in 1939. With an area of circa 10.000 ha, it stretches across the districts of Magé, Teresópolis and Petrópolis. Typical Atlantic Rainforest covers the park. Here are located the most beautiful rises of the Serra do Mar, some rivers cross the area; many of them originate there. It is also the home to a very rich fauna. Here, visitors can observe groups of monkeys, coatis, pacas, anteaters, armadillos, stags, wild pigs and with luck, also the region's largest hunters, the puma. Bird lovers can watch parrots, cuckoos and hummingbirds, among others. Reptile aficionados can look for two of the local poisonous snakes: the Jararaca and the Jararacuçu. There are many clear spots with typical grass vegetation and different fern species. Several orchid species, bromeliads and begonias can be seen along the trekking trail. Large trees as Cedars, Acacias, Tabebuias and Tibouchinas highlight the landscape's tropical impression. The Pedra do Sino with its 2.263m is the highest mountain of the Serra dos Orgaos. 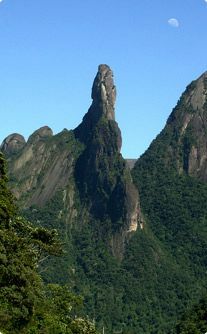 But the most famous mountain is the Dedo de Deus (Finger of God), 1.692m high. This area is ideal for hicking and climbing aficionados. Big and small waterfalls are found throught this region, perfect to cool down and relax after a day tour. The National Park is sourrounded by two cities. Petropolis situated at an altitude of 840m and a population of 255.000 people was planned by the German Julius Friedrich Koehler. The famous writer Stefan Zweig lived and died here. Petropolis was founded in 1843. Teresopolis with a population of 170.000 peopleis situated at 900m over the sea level. Founded in 1891 and named after the empress Teresa Cristina. Here you can also find the small museum Martius, named after the German botany researcher von Martius, who made botanical expeditions throught Brazil from 1817 until 1820. Copyright 2017 by Ecolodge Itororo Brazil.